This posting describes the essence of these platforms and how they create value for those who want to manipulate us. Platform businesses are businesses that create matches between people or organizations. For example, e-bay and amazon are platforms that connect people with goods to sell and people who want to buy goods. Uber connects people who can offer a ride to people who need a ride. Airbnb connects people who have a spare room to rent and people who need a place to sleep. There is an entire class of platform-based businesses that are very profitable that connect those who want to manipulate people and people who offer themselves up to be manipulated. I call these businesses “manipulation platforms”, and they may be the most powerful and dangerous businesses in society today. Almost certainly you do. We all do, every day. And the fact that we understand so little about the purpose of these manipulation platforms, how they work, and how effectively they work is part of the danger of these platforms. The secret of the manipulation platform is that it is split into two pieces: a bait layer and a business layer. We focus on the bait layer, almost entirely unaware of the details behind the business layer. Key to the bait layer is that it gives us “free stuff”… free stuff that we want or enjoy. We, those of us offering ourselves up for manipulation, think it is a great deal! What is better than free? But there is Faustian bargain for that free stuff. We “pay” for that free stuff by giving the platform some of our attention and details about ourselves. Our attention is how the manipulators get a chance to manipulate us. Our details about ourselves is essentially an instruction manual telling the platform what is the best way to manipulate us. It is the twin payments of our attention and details about us that make the manipulation platform so powerful. What is the bait these manipulation platforms use? The bait includes the content and services we consume and use online. It is the social networks we use to communicate with friends, the search engines we use to look for answers, the photo sharing sites, the online email, maps, and other applications we use. These companies do not offer this free content and services out of the goodness of their hearts. They offer this bait to harvest our attention and collect details about what makes us tick. 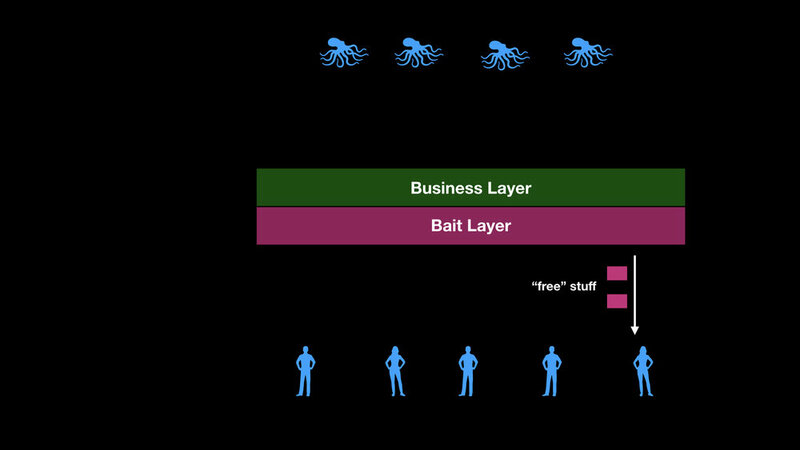 Whereas the bait layer is the content or services they give away for free (or at a significant discount), the business layer is the money making side of the business. This business layer is where our attention, harvested via the bait layer, is bundled up and sold to businesses, politicians, and other organizations willing to pay that attention. It is the business layer that creates value for the platform company. It is how they make their money. It is the reason they exist as a business. The users of the platform are not the customers. The users’ attention is the merchandise the platform business sells. The platform’s customers are those willing to pay for bundles of users’ attention. And as commercial businesses, the primary goal of these manipulation platforms is to maximize profits. It is this last point, increasing the value of those attention units for the manipulators, that is the focus of the rest of this posting. It is true that advertisement-based businesses have been around around for nearly 200 years. The newspaper “New York Sun” began selling newspapers at a loss in 1833 and making up the costs with advertising. Within a year it became the largest newspaper in New York and it was profitable. A new business model was born. Advertisement-based radio followed in the 1930s and TV in the 1950s. So yes, advertisement-based businesses, where other individuals and organizations pay the business for a chance to influence the readers, listeners, or viewers through advertising has existed for a long time. 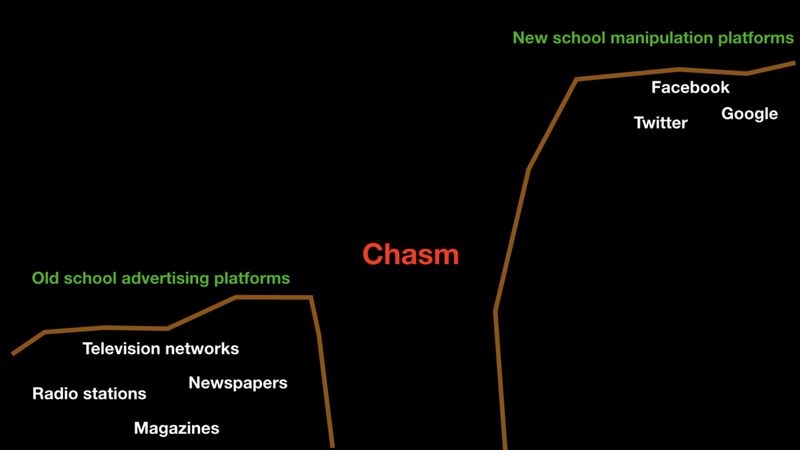 But there is a chasm that separates these old school advertising-based businesses from the new school manipulation platforms. One huge advantage the manipulation platforms have over old school advertising platforms is that they can identify and then gather huge amounts of information on each individual users. A lot of this information is gathered when we are directly using their platform. The platforms record what we search for, what videos we watch, what photos we post, who we communicate with, what we write in an online text editor, what events we ad to our online calendar, what posts we like, what we say in messages we post, what links we click through, what we say to our home speaker (do you have one in your home? ), and where we go with our phones (especially Android phones). These manipulation platforms have instrumented our lives to gather highly detailed data about us and about what makes us tick. The manipulation platforms also gather data about us when we visit other sites outside their platform. Many web sites around the Internet share information about us to these manipulation platforms when we visit their sites. Also, these manipulation platforms often have their own ad systems that show ads on other web sites. When these ads are posted on these other web sites and are displayed in our web browsers, the platform company collects information about us. The ad is in part a sensor to track where we go on the Internet. These manipulation platforms also collect tremendous amounts of information about us offline. For example, facebook buys information about its United States users from data brokers such as Experian, Transunion, Acxion, Epsilon, Oracle, and WPP. How much money do we make. How much money do we have. Do we own a home, and if so, how much is it worth. Do we buy the groceries in the family. Are we in a long-distance relationship. For many more examples about the details on us Facebook collects, see here and here. How many data points does Facebook have in its dossier on each of us? No one outside facebook probably knows for sure, but in 2016 ProPublica found 52,000 attributes for each user. That is a very detailed dossier on each of us. These detailed dossiers on individuals let the manipulation platform create very specific sub-groups that its customers, the manipulators, can use for targeting purposes. Different people react very differently to different messages. One group may be strongly inspired by one message, while another group may be strongly horrified by the exact same message. For example, in 2017 ProPublica found they could target users who explicitly expressed that they were a “Jew hater”, and in 2018 The Intercept found that Facebook itself had created a group of people interested in “White genocide conspiracy theory”. Messages that might be embraced strongly by Facebook users in these groups might horrify other users. Facebook has created tens of thousands of groups of like-minded people that manipulators can narrowly target. 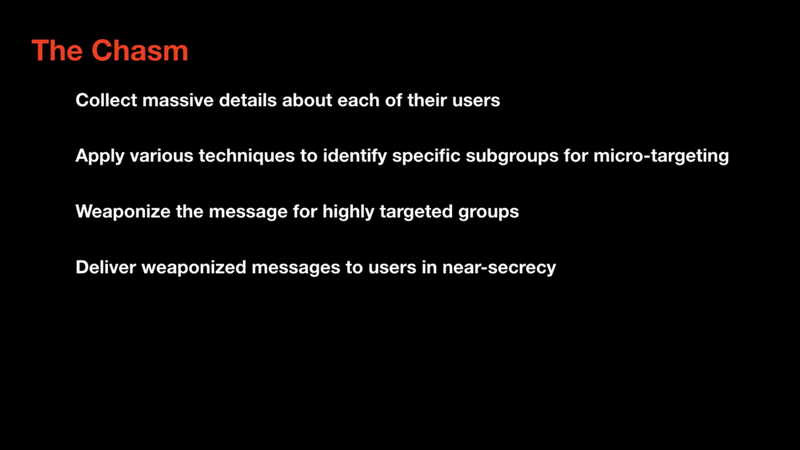 Very targeted groups lets manipulators design highly targeted messages that they know will probably hit home with that particular group while at the same time not exposing other people (who might be turned off by the message) to those same messages. Another huge advantage manipulation platforms have over old school advertising platforms is that they can conduct A/B testing to refine the message. Manipulation platforms can do this because (1) they can deliver individual messages to individual users and (2) measure the users reaction to each message. A/B testing is like a sports bracketing system. The manipulator can take two variations of the same general message (message A and message B), deliver them randomly to individual users, and then measure users’ responses. Did the user click “like” on the message? Did the user click through a link to read a story? Did the user repost the message? Did the user watch the video? Did the user forward the message to someone? Did the user comment on the post? All of these actions represent micro-engagements. These micro-engagements are trivial for a user to do (just click), so there is a good chance for the user to take an action. After some number of randomized experiments (we are talking science here 😉), the manipulator can determine which variation of the message (A or B) performed better. That message (the winner of that little contest) gets to make it to the next round of competition. And just like a sporting bracket system, after several rounds of testing the manipulator is left with a winner - the variation of the message that was most effective with a particular group they are targeting. That winning message is then released on the rest of the people in that group. The message most people in the targeted group will see has been scientifically honed through randomized trials to be incredibly effective. The message has, in effect, been weaponized. During the 2016 presidential election, the Trump campaign often ran 35 to 45 thousand A/B tests every day, methodically and maniacally honing their message to different groups. The ages of print media, radio, and television were dominated by advertisement-based businesses, Other businesses, politicians, and other organizations paid the advertising-based business for the opportunity to reach out and influence the readers, listeners, and viewers. But the Internet age has created a far more powerful capability to manipulate people. These manipulation platforms differ from their predecessors in that they track individual users, collect massive amounts of information on the users, create detailed dossiers on their users, use these detailed dossiers to create very specific groups that can be targeted with very focused messages, and support the weaponization of those messages by rapid and continuous refinement of the messages. Furthermore, since these messages are delivered to to individual users (i.e., not broadcasted for everyone to see), they are essentially dark messages, invisible to everyone except the targeted users. Through all these means, these manipulation platforms have the power to significantly change society.